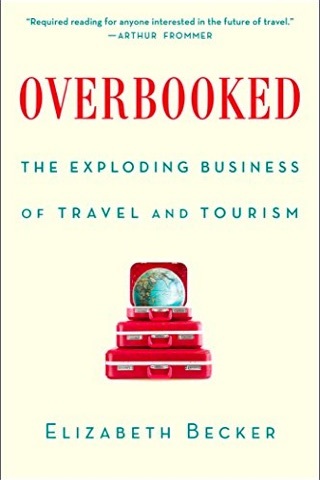 Elizabeth Becker’s Overbooked is part reportage, part travelogue and part annoying—not all in equal measure thankfully—and remains a useful primer for the reader with an interest in where the global tourism train is taking us. First published in 2013 (our later edition included a 2015-dated epilogue), Overbooked zooms in on case studies from around the globe used to highlight particular aspects of tourism. Divided into six chapters: the business of tourism, cultural tourism, consumer tourism, nature tourism, the new giant (China) and the old giant (USA), the book takes the reader on a trip around much of the globe. Hmmm. The white saviour meme raises its head on a few occasions throughout the book, as do plenty of US companies. Take hotel conglomerate Marriott for example—a company getting ridiculed online thanks to a cringeworthy fake history put together for yet another god-awful property on Vietnam’s Phu Quoc Island. Marriott flies the author out in a private plane to their “offset project” a vast reserve in the back blocks of Brazil—we guess a karma offset for what they are doing on Phu Quoc. Repeatedly through the book, there is a skew towards high end tourism being, if not the cure to the woes of overtourism, then at least a decent sized band-aid. But when you believe just the opposite (as we do), that budget, low-end tourism is the best way to support local communities in a low impact way—in essence where the trickle down effect has just one set of hands to pass through—reading Overbooked can be a frustrating experience. Roland didn’t see that train coming? Also, we think the author actually means Kampot, not Koh Kong (the latter had no resorts at the time)—a number of minor but annoying errors in the book. As for the Waikiki line, we couldn’t find any reference to Serendipity beach being compared to Waikiki by Lonely Planet, but having been to both, unlike we assume, the author, it is a ridiculous and totally out of touch comparison—no self respecting travelling hippy would string up a hammock on Waikiki today. To give this a Southeast Asian context, this really brought to mind the southern Thai islands like Ko Pha Ngan and Ko Tao, especially the latter. On both islands, much of the menial labour is undertaken by Burmese, often in uncertain and vulnerable working situations—and tragically they’re often used as fall guys when things go bad. Many tourists don’t realise that one of the reasons that beach bungalow is costing under $20 a night is because the staff are being paid peanuts (if at all). All that cheap travel brings with it a hefty price tag for others. We found the eco-focussed chapters on Zambia (touching on Mozambique) and Costa Rica to also be interesting, but again frustrating where the author’s clear preference for high-end tourism being the only way to do eco tourism “right”. Reading that the way forward is a world of $900 a night tent safaris with private butlers seems nonsensical to us. But instead of locally run, community focussed, low impact projects, we’re instead told about the work US millionaires are underwriting in the developing world—yes, more white saviour. On Paul Allen (co-founder of Microsoft with a net-worth in excess of US$21 billion), bankrolling a park in Zambia “For him, it’s not about making money. It’s about doing it right. His sister came here and fell in love with the place”. We’re not trying to denigrate the sometimes monumental tasks these wealthy individuals are undertaking, but surely there are projects being driven by the local wealthy as well? While far from perfect, the work Tomy Winata has done in Indonesia’s southern Sumatra could have been worth a mention perhaps. What Becker doesn’t do enough of, is give clear suggestions on how things can be turned around. Save getting a US gazillionaire onto your project, she doesn’t really get into the nitty gritty of how tourism can be better channelled to be a positive force rather than a destructive one. Yes there are general examples in the book, but the detail isn’t there. She does appear to think the high end offers promise, but in our book, it is the high end that is demanding the horizon pools, personal butlers and private flights. Approaches like limited ticketing, double pricing and other admission controls are barely touched on, nor are efforts to better distribute where people are going. A chapter covering this kind of material in some depth would have been a welcome addition. It would also have been great to have seen more coverage of projects that are doing good work and making progress in “bad places”. Just an hour from Siem Reap in Cambodia, in Banteay Chmmar, or, not far from Sihanoukville at Chi Phat, there are long-running community projects which tick a lot of the boxes of what tourism should be, and it would have been good to have had examples like that to show that even in destinations like Cambodia, where so much of the news is bad, there are good things happening and there are projects worth your support. Tourism is what you make of it. So next time you are going on holiday, go buy a history book. If you have some money left over, consider picking up a copy of Overbooked as well.